There was a lot to do in this production - the orignal plan was to paint the whole of Neverland on the flats for some of the scenes, but we just weren't going to have enough time to do it, since there was only one person doing it (ie: me). So we decided to have Neverland as projections and lighting, and for me to concentrate on only doing the victorian panelling for the house scenes, Nana's kennel, the Wendy-house (which unfortunately I have no decent pictures of), the totem-pole, St Paul's, and the wardrobe/hold. I like the use of the word only there. Luckily we had Alan's daughter Laura drafted in to do the crocodile, which was fantastic, and got a big laugh from the audience! Here's the flyer below, and some pictures of the stuff I worked on. The totem pole - made by Alan Corbett and painted by me. 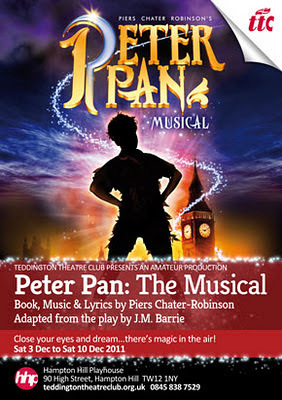 Peter Pan flies! I did the scenic painting for this, painting the flats to look like victorian panelling, and painting the wardrobe built by Alan to look real and aged. I also painted the silhouette of St Paul's that you can just see above the pillars. Parts of the set opened out or turned around to reveal white flats on the other side, which could be projected onto. In the Indian scene, gauze came down, onto which was projected a scene of the Indian camp. I created an image in Photoshop to be projected onto the gauze. I also painted the totem pole which was brought on stage by the actors and built up (see top). Another scene was the pirate ship. Parts of the victorian panelling remained, whilst other parts were taken away to reveal what looks like the deck of a ship, complete with the wheel at the top (originally covered with St Paul's. The wardrobe was turned around to reveal the entrance to the hold. This looks so good! It's really ingenious the way you've mixed painted boards, screens and projections, and the whole thing looks really effective. Particularly like the way the Victorian panelling doubles up as part of the pirate ship. Shame there aren't any pics of the Wendy house!